Specifically designed and produced for SmokinTex Models 1400 and 1460, 1500 series, and the 1500-CXLD Electric Smokers. These non-stick mats are perfect for anything you want to smoke that is more delicate, prone to sticking to a grill or that might tend to separate and slip thru the tines on the grills. Perfect for fish filets, boneless chicken or turkey breasts…anything requiring a tighter mesh to provide additional support and/or a non-stick surface. You can also use it for smoking nuts, vegetables and the like. The mat is easy to clean, just soap and water, even dish washer safe, and will give you years of service in our smokers. The special material is specifically made for low temperature and a non-flame environment. Perfect for our SmokinTex electric smokers. 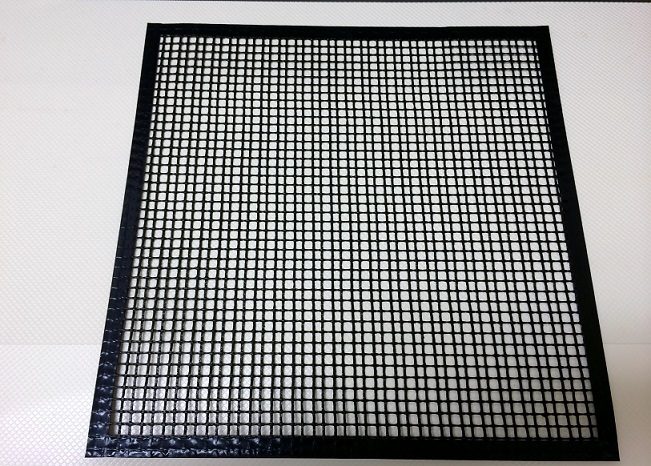 14 in X 14 in which fit great in our 1400 and 1460 models. 17 in. X 17 in. which fit our larger smoker grills models 1500, 1500C and 1500-CXLD.